Here is my first unit of Austrian Grenzers for my Avantgarde Division of my Austrian Lasalle Army. Still working with photoshop to improve the lighting, I believe I could have gone a little further here. The Grenz were the border forces of the Austro-Hungarian Empire. They functioned usually as light infantry and served with advance guard units. I believe most of the details for the 13th are correct, they were first raised in 1766. The unit was based in Northern Moravia now in the Czech Republic. I elected for this unit to have white leather, by 1809 the 13th were in brown tunics. I have tried to paint the drum correctly, but still have left off putting stripes on the flagpole.....next time. The buttons may be wrong, I painted yellow and I suspect they were white. There appear to be quite a few Serresaner (the fellows with the red cloaks) in this unit, Doc Smith tells me they were Balkan muslims who acted as sharpshooters, scouts and even police in the Austrian army. Next up the 3rd Uhlans! Another excellent unit John. They look good based that way, much 'tighter' than my own smaller units. The paint job is very impressive, I really like those faces. I agree: a great painting job. I can not find the muslim sharpshooters amongst your figures. Do were they armed with muskets? thanks guys, the sharpshooters have the red cloaks folded on top of the knapsack, these have muskets. the 13 vallachisch regiment was based in Caransebes, Banat and was made of romanians. Absolutely correct. I'm of 100% Grenzer descend from Caransebeș. It was called the 13th Regiment in honor of our ancestors the 13th Legion based in ancient Tibiscum, near Caransebeș. Great job! Yes, the 13th Regiment was in Caransebeș, region of the Banat, nowadays Romania. 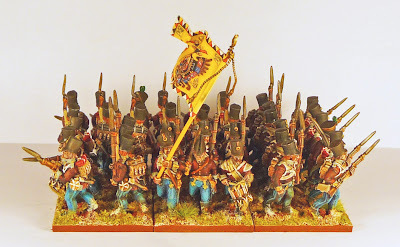 The Seressaner were not in the 13th Regiment. 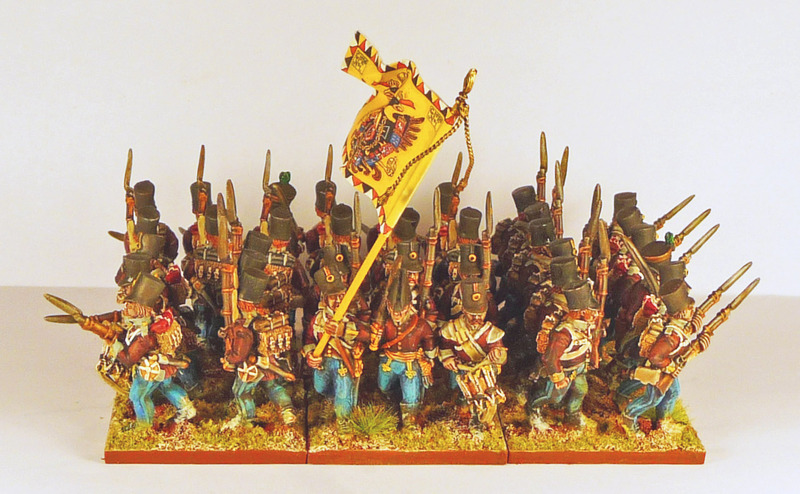 The Seressaner were Croatian border militia. As the Pandours were Serbian border militia.